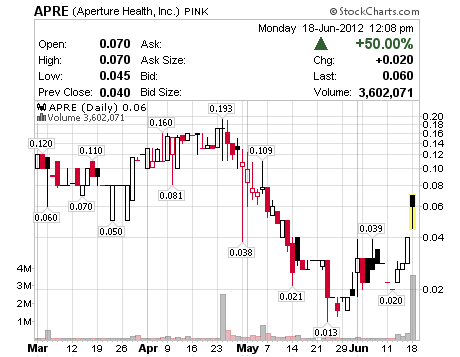 Aperture Health (APRE) Acquiring Doctors on Call? Aperture Health, Inc. announced today that it has executed a Letter of Intent to acquire Doctors on Call, one of the largest in-home medical practices in New York City. Doctors on Call, consisting of over 35 physicians and physician extenders, is devoted to the care of the frail and/or homebound elderly throughout New York City. Founded in 1968, and available seven (7) days a week, Doctors on Call offers home-based medical care including chronic disease management, laboratory, diagnostic x-ray, ultrasound, podiatry, and annual wellness visits to those incapable of accessing traditional primary care. Further, Doctors on Call has obtained preferential contracts with major Health Maintenance Organizations to provide high quality cost-effective medical care to patients transitioning from the institutional (hospital or skilled nursing facility) to the home setting providing over 2,000 patient visits a month. The Center for Medicare & Medicaid Innovations has selected Doctors on Call to participate in the Independence at Home Demonstration Project. Among sixteen (16) participating practices nationwide, Doctors on Call was the only medical group in New York City to be selected for this three (3) year project, which is aimed to improve the lives of patients living with chronic illnesses by providing quality medical care right in the patient’s own home. Aperture Health. through its wholly owned subsidiary Triad Therapeutics. operates as a fully JCAHO accredited home IV therapy company, achieving this “gold standard” status in 2007. The company has built a well respected reputation in its industry for its therapy expertise and commitment to care for its patient clients. The company services clients throughout the States of New Jersey, New York and Connecticut, providing opportunity for organic growth. Triad’s full time marketing and sales personnel continuously represent the company in the core services areas, growing and maintaining the company’s referral source base. Patient referrals are made from physicians, hospitals, insurance companies, veterinarians and hospice care providers that have established a professional rapport with Triad.